Best Choice Products Portable Disc Golf Basket Double Chains Steel Frisbee Hole. BCP SKU: SKY3606. 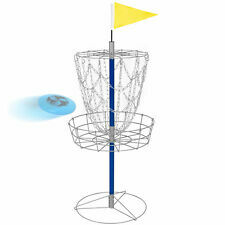 Toss a winning shot with this portable disc golf basket! Heavy-guage, galvanized chains will also allow for high-performance catching as a disc hits its target. You are bidding on a New Discraft Protoype McBeth ESP Kong distance driver. 173-174g New and 9.5/10 Disc will be box shipped ! The Dominator is a speed 13 model designed to be a long line, shot shaping distance driver for advanced players. Similar to the Katana, with more high speed stability, the Dominator has the glide to maximize distance with a predictable turn. A miniature version of the Innova Aero golf disc. Fun to throw and play on mini golf baskets. 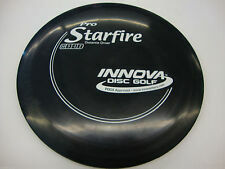 Shape/Mold: Innova Aero. The price listed is for six minis. Mini disc and stamp colors will vary based on availability. Most players have one versatile driver they reach for most often, and Undertaker is the new choice. Great glide, smooth finish, nice grip, big wins. Joe's Universal Flight Chart. These rates apply to golf discs and T-Shirts. Wiped Ink 7.5/10 I do combine shipping Double stamp First run? 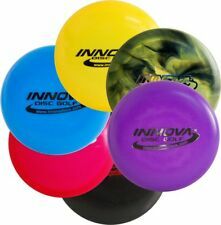 Picture Innova's Xcaliber with a little more speed and stability and you'll know what this disc is like. Do you think have what it takes to throw this disc?. Joe's Universal Flight Chart. These rates apply to golf discs and T-Shirts. The Archon is a new Speed 11 Distance Driver that blends the graceful long turn of the Katana with the smooth fade of a Wraith. It has been described as a longer Valkyrie. These rates apply to golf discs and T-Shirts. More players agree: Buzzz is the best golf disc you can buy, period. It's an ultra-dependable, straight flying midrange that you'll reach for again and again. Throw it hard and versatile Buzzz will hold any line you put it on. Give it a rip and see for yourself. These rates apply to golf discs and T-Shirts. Low Speed Stability: 3. High Speed Stability: -2. Joe's Universal Flight Chart. We took the best aspects of the Avenger -- its speed and glide -- and flatted up the edge. Ams will love it for its flat flight and smooth finish. Pros dig it for mondo turnovers and sky rollers that go forever! It says driver on the front but it is truly more of a mid range disc. The Prototype Star Firestorm is a Speed 14 driver capable of serious distance. Joe's Universal Flight Chart. These rates apply to golf discs and T-Shirts. High Speed Stability: TBD. Low Speed Stability: TBD. The low profile of Discraft Machete is built to slice through headwinds with unparalleled predictability. These rates apply to golf discs and T-Shirts. Low Speed Stability: 4. High Speed Stability: 0. New-1-4" Sticker. "Steel Your Chains". Multi Color-Custom Design. Water Not Fade Away Proof.Long Lasting 10 Years Out Doors. Excellent discs in great condition! Very minor scuffs. No Ink 7.5/10 I do combine shipping Disc is a little more aqua color than pics show. This is a limited run (roughly 200 total made) of this beautiful Pine color for the Kastaplast K3 Berg. The stickered weight is 170g. Kastaplst K3 Berg, Green, rare limited run. DISC GOLF INNOVA GSTAR KATANA LONG DISTANCE DRIVER FAST & SUPER LONG 166g RED. Condition is Used. Shipped with USPS First Class Package.This disc is like new as I never had the arm to get the most out of throwing it. The one or two light rubs on it are probably from rubbing up against another disc in the bag and not from actual play. Paul McBeth adds a second disc to his line up - the prototype KONG distance driver. You'll feel a connection to this disc as soon as it's in your hand. These rates apply to golf discs and T-Shirts. 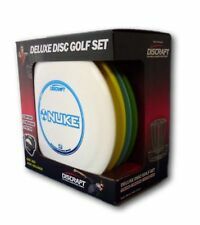 You are bidding on a New Discraft Protoype McBeth ESP Kong distance driver. 170-172g New and 9.5/10 Disc will be box shipped ! Axiom Special Edition Vanish 11/4/0/3.5 used. Condition is Used. Shipped with USPS First Class. The Katana is built with the finesse thrower in mind. Hit the angle right and watch it bolt out of sight. The physical characteristics resemble a Boss with the flight characteristics of a Sidewinder on steroids. Very cool colors. The Wave. Those with slower arm speeds will quickly make this their go-to distance driver, while players with faster arm speeds will have fun launching this disc into huge anhyzers and turn over shots. 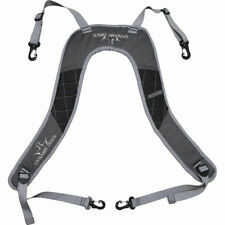 Looking for a disc to get max distance in tough wooded situations that require touch and finesse?. A distance driver for humans who want to soar with gods. The Daedalus has wings to fly far down the fairway. The Daedalus is a new maximum downwind distance driver crafted for less powerful players. Predictable flight characteristics power the Escape past all other fairway drivers, perfect for all skill levels. These rates apply to golf discs and T-Shirts. Joe's Universal Flight Chart. Low Speed Stability: 3. 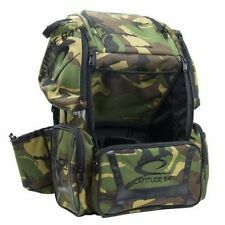 The DGA Starter disc golf bag holds up to 10 discs and like all DGA products it looks great on and off the course. It's made of the highest quality materials so you know that it's durable enough to last in even the toughest outdoor conditions. No Ink 6/10 I do combine shipping "Cowtana" stamp Pre.Flight Pre.release Still plenty of life left in disc haven't thrown disc but definitely less stable this run was known to be pretty stable. Millennium Sirius Orion LS 166 gram golf disc factory dyed Long Straight Driver. Condition is Used. Shipped with USPS First Class Package. Embossed on the backside "Innova". Not sure what model actually-feels and looks like a firebird. But not sure. Advanced players love the overstable, low-profiled Zone putter. Joe's Universal Flight Chart. These rates apply to golf discs and T-Shirts. High Speed Stability: 0. Low Speed Stability: 3. Range: 2.5. DISCRAFT Barstamp Rare Milky Glow Z Force Disc Golf Distance Driver!! DISCRAFT Unique Retro Stamped Swirly Esp Machete Overstable Disc Golf Driver! DISCRAFT First Run Z Mini Buzzz (6” Mini Disc Golf Disc) Buzz!